The Adventures of Maui Don - Dolphin Dude: Who Is This Crazy Person? 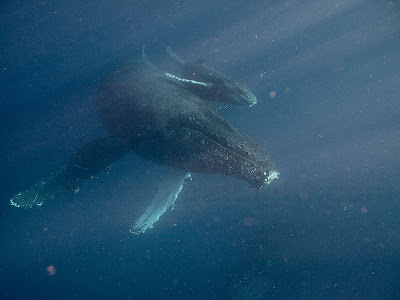 My heart was racing when this giant Humpback whale turned to swim directly toward me this morning. Especially since it was a protective mother with her small calf in tow. 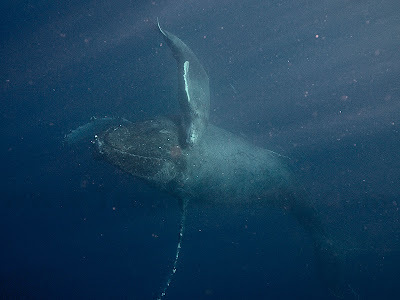 Of course, they were just checking me out, seeing who this crazy deep-water swimmer was. Click HERE for more photos from this morning's encounter. omg Don! incredibly Magnificent! whoaaaaaa! Incredible! Thanks Don! See you at the end of April or beginning of May! Whoa ... Where the heck are you swimming that you're seeing this? All I remember seeing was sand, coral, sand, coral, a few fish, an eel, and a bunch of golf balls. We were clearly on the wrong track for the kind of NGO moments you're capturing.